The SDSU West initiative to redevelop the Mission Valley stadium site appears headed for the November ballot, along with a competing measure. Petitioners associated with FS Investors, the group backing the competing SoccerCity proposal, filed an appeal last week contending that Friends of SDSU, not formally affiliated with San Diego State University, had misused the university’s name, deceived voters and violated election law with the SDSU West proposal. On Wednesday, a three-judge panel of the 4th District Court of Appeal denied the petition to strike recent Superior Court ruling that Friends of SDSU, comprised of alumni, business and community leaders, can legally use the university’s name as it campaigns ahead of the election. A representative for SoccerCity backers could not immediately be reached for comment. Barring further legal challenges, both initiatives to develop the site, where SDCCU Stadium currently stands, appear headed to the November ballot. 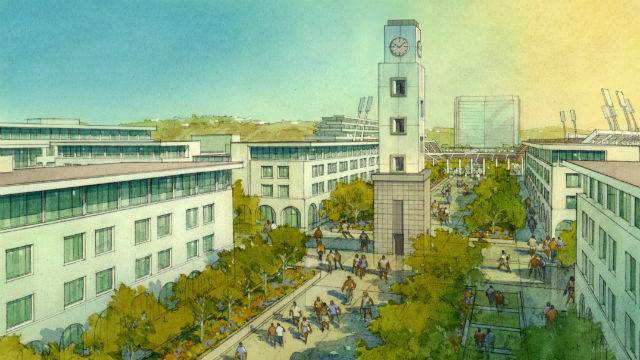 SDSU West is backing a proposal for a new 35,000-seat Aztecs football stadium. The measure includes hotels, retail space, a river park and an academic campus to be shared with commercial office tenants. Supporters of whichever measure receives more votes, provided it cracks majority support, will likely be given an opportunity to negotiate with the city over the land.